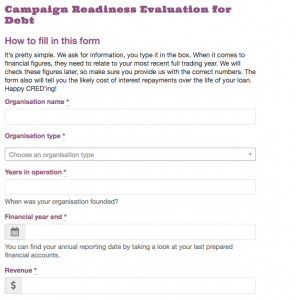 Back to basics: How do you get started with a crowdlending campaign? Lending can seem pretty scary, so we’ve decided to go back to the basics in this series and explain everything you need to know. We started with a brief history of lending and how lending works. Second up: how do you get started with a campaign? The first thing you need to check is your structure: are you set up as an organisation? Crowdlending the way we do it is only for those folk that have set up some form of organisation – be it a company, a school, a charitable trust, a co-op, a club. The second thing you need to check is: will you be able to repay your loan? We’ll ask for some basic financial information in our CRED to check this, but you should be honest with yourself first. If you borrow money, will you be able to repay it? We don’t want to let you get into a situation where you definitely can’t repay your crowd. Finally, you need to know what the money would be used for? How is it helping your organisation? The pitch to your crowd will need to be clear. Which means you need to be clear with yourself. How does the CRED work? 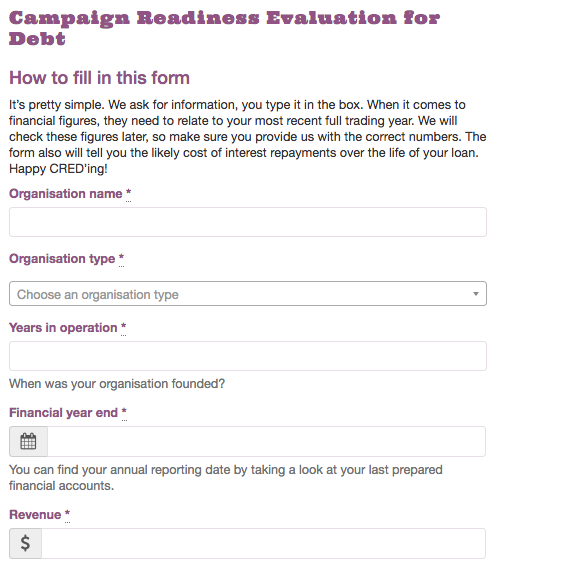 Your journey begins with our Campaign Readiness Evaluation for Debt (aka the CRED). To get an insight into your organisation and your ability to repay the loan, we’re gonna ask you some questions. If you have your organisation’s financial statements at the ready, it will only take a few moments…five minute long moments to be precise! The CRED works by pulling out a handful of financial measurements from your statements – the most important ones being how solvent your organisation is (have you funded yourself through equity and profits or through debt?) and the liquidity of the company (how effectively you manage your short-term cash flow). And your combined score from all of the measurements is compared to our ready / not ready threshold. Next you’ll be asked to fill out your basic lending request. Don’t worry, none of this information is set in stone! After that, we’ll be in touch to set up CrowdfundingU. If you’re a smaller campaign (under $100,000) we’ll just run you through a two to three session programme. If you’re looking to raise more, we’ll help you through the complete CrowdfundingU programme to make sure you’re ready to go out to your crowd in a big way. 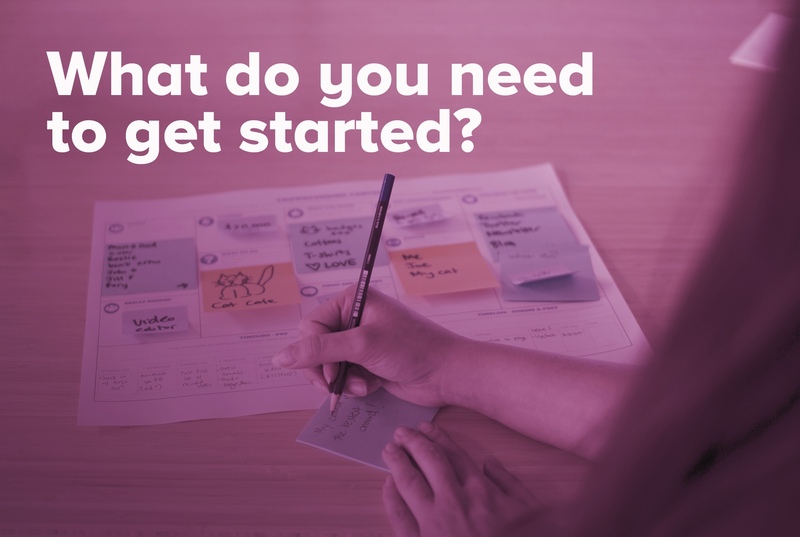 CrowdfundingU covers everything you need to do from creating your documentation, understanding how not to be false or misleading, learning how to create a comms plan, through to what you should include in your pitch video. Once all your content is created, we’ll do one final check on your page, your leadership team, and your plans. Then we’ll hit go! Before your campaign is live, you’ll need to have a plan around communication. Some comms will come naturally out of celebrating milestones, and some will be pre-planned (weekly updates, pitches to media, etc). Hopefully, you meet your goal by your deadline! PledgeMe checks all of your lenders (to make sure they are who they say they are) and sets up the loan contract between you and your new lenders. We’ll be in touch regularly, especially to remind you when your loan repayments are happening, and can help with any questions as you go. How do you figure out your repayment terms? Really, this is up to you. You can set the interest rate at something you think (or better yet, know) will be of interest to your crowd and is also affordable for you. We can help you figure out what the right balance for you and your crowd might be. What does it mean if you can’t run a campaign? It doesn’t mean you’ll never be able to run a campaign! It just means right now it’s not right for you. You could look at running a project or an equity campaign, or just wait until your revenue and equity has increased (or your costs and liabilities have decreased) to a point where repayment looks possible. Don’t take it to heart, we still think you’re pretty rad. Promise.